RATON -- New Mexico Department of Game and Fish investigators are looking for information that would assist them in solving a case in which a trophy buck antelope was illegally killed on or shortly before June 16, 2012. Game and Fish officers found the antelope carcass near Highway 193 between Raton and Farley, in Colfax County. 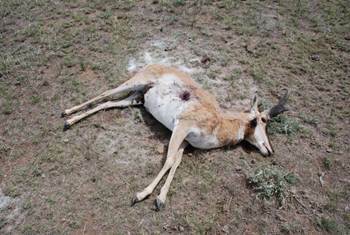 The antelope was left to rot after it was shot. The Department offers rewards for information that leads to the arrest or charges against wildlife law violators. Please call toll-free, (800) 432-4263 if you have any information regarding this crime or any other wildlife violation. Callers can remain anonymous and receive $350 for information about cases involving antelope. Local landowners are also donating money to increase this reward to $500.